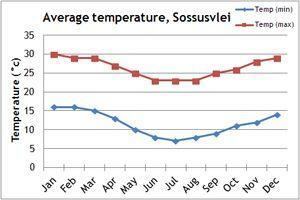 Our climate charts will give you an idea of the weather conditions in Namibia. Most of Namibia has a sub-tropical desert climate, with low rainfall and humidity. The dry season, between April and September, is considered to be the best time to visit Namibia. During these months the temperature is a relatively cool 25 degrees centigrade, though nights will be much colder, with frost at higher altitudes and in the desert. 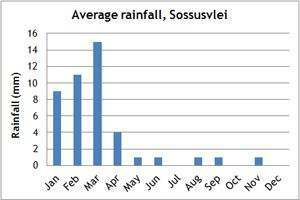 Most of Namibia's rain falls between December and March. This is usually in short but heavy bursts in the afternoon. October and November are usually dry, but with very high temperatures, which could make a walking safari uncomfortable. If you can't make the dates of our group departures, then take a private departure on dates to suit you, or we can create a Tailor Made holiday to Namibia, especially for you and your family or friends.